Grace Winter is 22 years old when she embarks on a journey to America with her new husband. When the ship sinks, Grace makes it into a lifeboat without Henry. The boat is overcrowded and full of conflicting personalities. As the weather worsens and no one comes to their rescue, the survivors have to make difficult decisions. What lengths will Grace go to in order to ensure that she makes it to safety? From the first pages, we know that Grace survives her ordeal at sea. In fact, she is on trial and writing down her recollections of those weeks in the lifeboat. But the reader is uncertain exactly what she is on trial for and who survived with her. 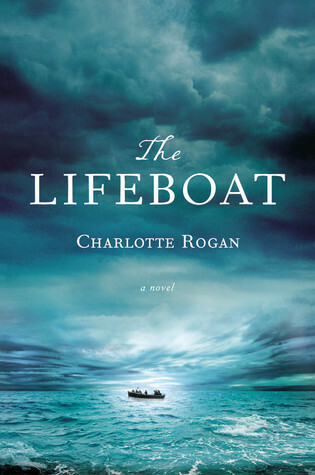 The story goes back and forth between the present as Grace and her lawyers try to mount a defense and the past as tensions rise on a tiny lifeboat with limited supplies and lots of people in conflict. I really wanted to like this book. It sounded like a fascinating premise. But the story fell flat for me. Grace is truly the main character in this novel. While we get a bit of information about her husband Henry and some of the people on the lifeboat, the only person who really gets a lot of attention is Grace. And yet I don't think you can say that we really know her. She is purposefully ambiguous. The people hearing her testimony and we who are reading it are supposed to be unsure about what is the truth and what Grace is twisting in order to look better. That, unfortunately, makes her a rather unlikable character. Perhaps it is because she is suffering from the trauma of her experience, but she comes across as completely detached from what is going on and oftentimes, her decisions don't seem to match up with her character. It seems that this book is supposed to make us think about the choices we make when pushed to the most extreme of circumstances. It doesn't always accomplish this though, because the choices are either made by an ambivalent, unreliable narrator or by characters we hardly know. It's not bad for a first novel, but I had hoped for characters with more depth and development than we find in The Lifeboat. Did you enter the giveaway yet for Brandilyn Collins' new book Double Blind? Check it out here. Well poo :( The premise sounds great, too bad it fell flat! Those kind of books almost break your heart don't they? It's disappointing, certainly. I don't have to like a character. In fact, I find it interesting when I really despise the protagonist. But I like to feel something! Good review-I hadn't heard of this book before and I won't be in any hurry to read it now :) Sounds like an interesting premise for a book though. It does, doesn't it? I really wanted to love it...sigh. I liked this one more than you did, although I wanted more shocking events! I think Rogan was going for Grace being deliberately obscure and us having to piece the clues together and realise her character was completely different to the defenses she made - but Rogan didn't quite pull it off. You should read Jamrach's Menagerie, now that's a shipwreck survival story! It does seem somewhat anti-climactic, doesn't it? You get all of this buildup to the terrible things that happened on the lifeboat and then...it's just not so shocking. I will definitely look into Jamrach's Menagerie - thanks for the suggestion! Yeah, I've heard that this one wasn't that great which has prevented me from picking it up while out. I think Sam, above, mentioned that it just didn't seem very realistic given the circumstances. Hmm.. that really stinks. The cover art is so beautiful too! It was a great premise. I suppose you can't love every book that you read! It sounds like if there had been strong character development for everyone on the lifeboat, this could have been a terrific novel. It would have added a lot to an interesting idea!